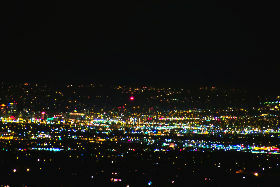 Top: A 3-watt red Luxeon LED at a distance of 14.82 miles (23.85 km) with downtown Salt Lake City in the foreground, as viewed from the south end of the path and looking toward the northeast. north end of the path and looking toward the southwest with a 300mm equivalent zoom..
Bottom: On the same path, but looking in the opposite direction (toward the southwest), with downtown Salt Lake City (and the city cemetery) in the foreground and the 3-watt LED in the background. Photo by Gordon, K7HFV. Click on either image for a full-sized version. Did you even wonder if the phase-coherence of Laser light might impede the effective transmission of amplitude-modulated intelligence on an optical communications circuit over an atmospheric path, and whether or not noncoherent light may provide superior performance under similar conditions? I did, so I decided to check it out. 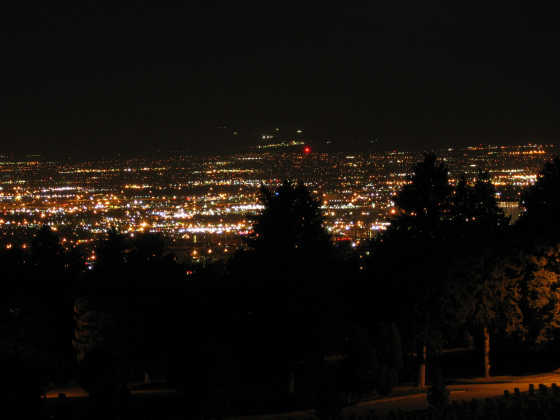 For this test, which occurred on 4/25/07, I was on the west side of the Salt Lake valley while Gordon, K7HFV and Ron, K7RJ were in the northeast corner of the valley, near the Salt Lake City cemetery - a distance of 14.82 miles (23.85 km.) This optical path crosses a "bowl-shaped" valley and cuts across part of downtown Salt Lake City. Often within this valley, thermal stratification occurs, often disturbed by diurnal air movement. With another large valley (with a large body of water) located to the south, and the Great Salt Lake located to the north, such air movements are very common - not to mention cold air that often "falls" down the mountain canyons, causing further mixing of the air volume. On this evening the temperature was about 55 degrees F (13 C) at the start and there was only a very slight breeze. Interestingly, despite fairly calm air, all of us noticed that it seemed that the city lights "flickered" more than they had done during previous tests. 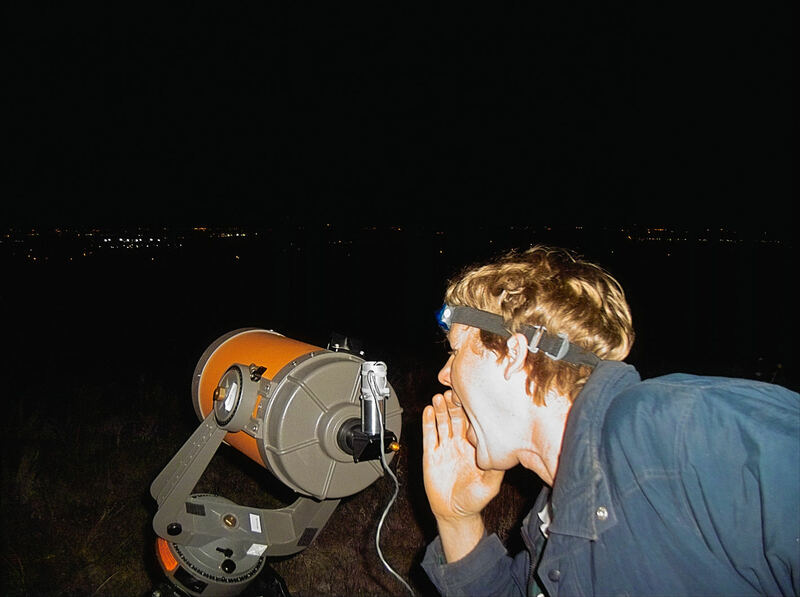 Once a voice communications link had been established using the Luxeon LED and Fresnel lens systems (achieving in excess of 40dB signal/noise ratio, despite interference from urban lighting) and I set up the equipment for the evening's main experiment. 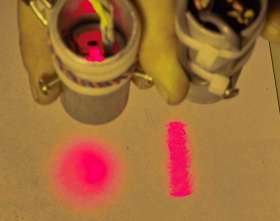 Top: Relative spot sizes and shapes of the LED (left) and laser (right.) The color and saturation of the two spots has been exaggerated to make them easier to see. Center: The spectra of the Laser. Bottom: The spectra of the LED. Note that there was some "thickening" of both spectral lines owing to saturation of the camera's imager. The objective of this evening's experiment was to quantify the difference in scintillation between coherent light as emitted by a laser diode and noncoherent light as emitted by a standard LED: It has been suggested in research (by NASA, Olga Korotkova, and others) that nonuniformities (e.g. "cells" of air with different temperature, pressure, and humidity) in the air volume between two sites would result in greater apparent scintillation when using coherent light sources as compared to noncoherent light sources. While we had done a similar experiment during the previous testing, it wasn't really a fair comparison: Previously, the light from the LED was emitted by a fairly large aperture (a 250mm by 318mm Fresnel Lens) while the cross-section of the beam from the Laser pointer was only a few millimeters in diameter. Because the amount of scintillation is strongly related to the size of both the emitting aperture and detecting aperture, by this fact alone the Laser's signal would have experienced more scintillation. Use exactly the same optics for both the coherent (Laser) and noncoherent (LED) transmissions. Use exactly the same optics for reception of both sets of signals. Because of the distance (about 15 miles) it was necessary to use good optics to collimate the beam, so I decided to interface to an 8 inch (20.3cm) reflector telescope (a Celestron C8) that I have. The effective aperture of this telescope, taking into account blockage by the secondary mirror, is approximately 50.27 square inches (approx. 289 square cm) - a respectable size. Several months ago, I happened to note that a local hardware store had Laser levels on a clearance sale for $3 each, so I bought several of them, knowing that the $3 price tag was a good price for the Laser alone. Attacking the level with a variety of tools (which destroyed the level, as it turns out) yielded a self-contained Laser module that ran directly from 3 volts. 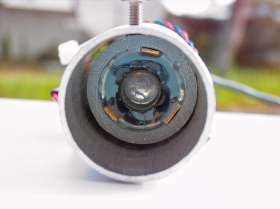 As is, the Laser module could not usefully illuminate the telescope's optics owing to its very low divergence, so I unscrewed the lens from the laser module in order to defocus the beam to a divergence suitable for interfacing with the telescope's optics. While this significantly "de-focused" the beam, it was still far too narrow to be useful: To remedy this, I removed the plastic lens from the Laser module, turned it around, and re-installed it, thereby increasing the amount of divergence, allowing me to more-efficiently illuminate the telescope's optics. The optical outputs of typical Laser diodes have a property that complicates efficient beam collimation: They produce a narrow, "fan" beam - a property illustrated in Figure 1. Without complicating the optics, it is difficult to "capture" most of the beam's energy (using some sort of optical device that would have been capable of making the beam more rectangular) and properly illuminate the optics of the telescope, so the only other option is to only take the very "center" of the beam, discarding the majority of the optical energy: If the beam is collimated too strongly before being applied to the telescope, the collimated beam would fully not fill the aperture and would be cut off on the sides. For the noncoherent light source, I found a large (10mm) LED in my LED collection - a Radio Shack P/N 276-086. This LED is rated for an optical output of 5000 mcd at 36 milliamps with a beamwidth of 30 degrees at a wavelength of 660 nm - very close to the same wavelength of the Laser, as can be seen in Figure 1. When testing, I could tell that the LED's built-in lens did not efficiently illuminate the telescope's optics (that is, the LED's beam was so wide that much light was "wasted" off to the sides) but I was satisfied, when comparing the optical output of the LED with that of the Laser through the telescope, that sufficient light was available, so I did not add any extra optics. On the telescope, I used a standard 1-1/4 inch eyepiece mount and mirror-type star diagonal, so it made sense to use it to hold the Laser and LED modules. Rummaging around my scrap metal pile, I found some aluminum tubing that was exactly the right size to slide into the compression-mount eyepiece holder. To mount the LED and Laser, I found some old Thermalloy (tm) TO-5 transistor aluminum heatsinks which fit inside some gray ABS pipe that I had laying around. 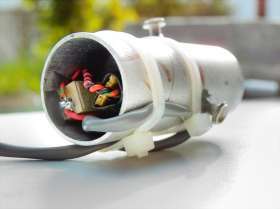 The Laser module and LEDs were first glued to the TO-5 heat sink, and after this, the heat sink (with the LED or Laser attached) was then glued inside a piece of ABS pipe, shimmed to center it properly. To mount the ABS section inside the aluminum tubing - and to provide a means of precise optical alignment - I drilled and tapped three 8-32 screws: These setscrews can be seen in the pictures of Figure 2. To optically align the LED/Laser, the screws were loosely tightened and then, using a thin-blade screwdriver, I was able to reach in and adjust the orientation of the emitter and adjust the setscrews as necessary until it was properly aligned with the telescope's optics. After this, the set screws were tightened, alignment re-checked, and then the screws and ABS piece was glued into place. When installed (see the bottom image of Figure 2) the light output of both the Laser and LED completely illuminated the entire aperture of the telescope. Further testing also revealed that the beam could be easily focused by the telescope to provide best possible collimation. The only practical "easy" way to linearly modulate a typical Laser module is to use PWM (Pulse Width Modulation) techniques. Because the Laser module already included the circuitry necessary to be operated directly from a 3 volt battery, I simply constructed a voltage regulator using an NPN transistor and two red LEDs to provide a regulated 3 volt source. Because the PWM circuit uses a current sink as its output stage, it was necessary to provide a loading resistor to provide enough load for the circuit to work, so the output from the modulator was paralleled with a 20 ohm resistor: With proper adjustment of the drive current, the Laser module was properly driven with the PWM waveform, yielding good-sounding, linear modulation. Interfacing the LED was much easier: A 150 ohm series resistor was used to limit the current to the LED to a peak value of about 60 milliamps while a parallel power resistor of about 17 ohms was used to provide loading for the modulator. While the 60 milliamp current exceeds the maximum rating of the LED, the average current would be half of this, owing to the nature of the PWM waveform. Top: The back end of the Laser module. Center: The front end of the LED module. Bottom: The Laser module installed in the telescope's eyepiece mount. In our previous testing, it was noted that it was extremely difficult to aim the Laser pointer while it was mounted on a tripod. 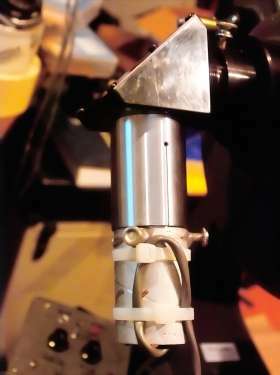 Without micrometer-type adjustments, the slightest touch would knock the Laser completely off-point and without a sighting device, it was difficult to get even coarse pointing: The viscous "fluid head" of the tripod turned out to be more of a liability than an asset when trying to precisely adjust the aiming as it caused a slight amount of backlash in adjustments. The telescope has the obvious advantage in that it's a telescope! With the 3-watt Luxeon in operation from the far end, I had a ready visual reference upon which I could train the telescope and with it, I could not only see the very bright red LED, but I could also individually discern Ron's and Gordon's flashlights as they were standing near the optical transceiver at their end. I then removed the eyepiece and substituted the Laser module, it took only very minor adjustments (of both pointing and focusing) to peak the signal, using my own received test tone being heard via the optical link from the far end. Comment: Later measurements indicated that the laser's horizontal beamwidth was on the order of 0.07 degrees while the horizontal beamwidth of the LED in the telescope was roughly 0.2 degrees - both measured from the points at which each became visible, and then disappeared again. Important note about the sound files found on this web page: Due to the MP3 audio compression, finer details of the scintillation are lost, but the audio files "sound" to the ear pretty much identical to the uncompressed PCM files to which they were originally recorded. All of the audio clips were transmitted using the 8 inch reflector telescope and received using a receiver with the photodiode mounted at the focus of a poor-quality 7"x10" (17.8 cm x 25.4 cm) vinyl "page magnifier"-type Fresnel lens - that is, an area of approximately 70 sq. in, or 452 sq. cm. Unfortunately, the audio clip of the test tone from the Laser experienced some clipping (overdriving) when the recording was made - but clipping occurred only on higher audio peaks. In both clips, some "clicking" can also be heard in the background (especially on the LED clip) and this was from the strobes of aircraft flying slightly above the optical signal path. A more "real world" comparison may be heard in the clip below. This clip directly compares the "sound" of the Laser's signal with that of the LED. In this clip, the Laser is tested first, and then the LED is immediately installed to assure that both tests were done with the same atmospheric conditions. This clip has been edited to reduce its length and improve continuity: At the end of the clip, K7RJ's comments (transmitted via LED from the end of the path where the bulk of the recording was made) were mixed in from a recording made at my end as received via the lightbeam link. During the entire transmission (except during the 1kHz tone segment) a 4kHz "pilot" tone was transmitted along with the normal audio, but this has been notched out (except for the brief test segments) to make it more "listenable" as the 4 kHz tone is really annoying. 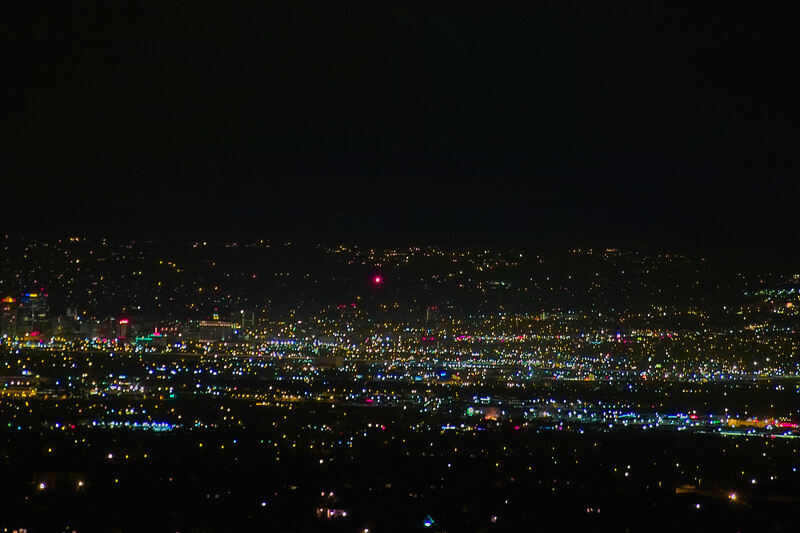 Other than the removal of the pilot tone, no other filtering or amplitude adjustment was done, hence the presence of the 120 Hz tone (and harmonics) from the city lights. The rhythmic clicking of the strobes of passing aircraft can also be heard in various parts of this recording. 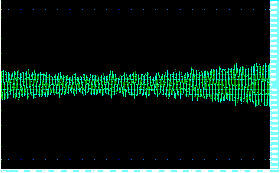 Top: Waveforms of a portion of the 4 kHz test signal transmitted by the Laser. 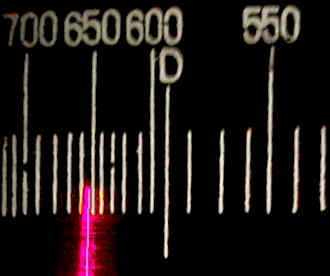 Top-middle: Close-up of a portion of the scintillation of the 4 kHz Laser-transmitted tone. This portion has been "zoomed in" in both the vertical (amplitude) and horizontal (time) axes. Bottom-middle: Waveform of a portion of the 4 kHz test signal transmitted by LED. Bottom: Close-up of a portion of the scintillation of the 4 kHz LED-transmitted tone. Note that the rate-of-change of amplitude is much slower than with the Laser as evidenced by noting the time scale along the bottom of the images. Note different time axes for all images. The waveforms in Figure 3 offer close-up graphical analysis of 4 kHz tones from the original uncompressed PCM recordings show the true nature of the scintillation. These waveforms have been bandpass-filtered from 1 kHz to about 6 kHz to remove 120 Hz energy from the city lights and the segments from which the analysis was taken have been amplitude-normalized to 16 bits full-scale. It should be noted that the nature of scintillation (depth and rate, for example) is strongly dependant on the current conditions within the air volume through which the light beam is being passed and will vary greatly over time! While the "primary" period of scintillation is approximately 10 milliseconds (100Hz) but there is evidence that there are harmonics of this rate to at least 2.5 milliseconds (400 Hz) - but the limited temporal resolution of the test tone makes it difficult to resolve these faster rates. 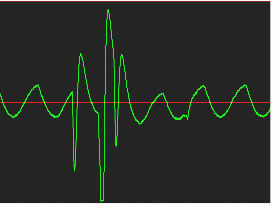 Other strong scintillatory periods evident in the audio sample occur at approximate subharmonics of the "primary" scintillatory rate, such as 75 and 150 milliseconds. The rate-of-change of amplitude during the scintillation is quite rapid: Amplitude changes of over 30 dB can occur in just 20 milliseconds. The overall depth of scintillation was noted to be over 40dB, with frequent excursions to this lower amplitude. It was noted that this depth measurement was noise-limited owing to the finite signal-noise ratio of the recorded signal. The 10 millisecond "primary" scintillatory period observed in the Laser signal is pretty much nonexistent while the 20 millisecond subharmonic is just noticeable. 150 and 300 millisecond periods seems to be dominant, with strong evidence of other periods in the 500 and 1000 millisecond period. The rate-of-change of amplitude is far slower: Changes of more than 10 dB did not usually occur over a shorter period than about 60 milliseconds. The overall depth of scintillation was noted to be about 25 dB peak, but was more typically in the 15-18dB area. In analyzing the 1 kHz tones from this test, it is more difficult to realize the apparent depth of the scintillation: On the Laser, depths of well over 30 dB are readily apparent, but due to clipping on the original recording, the true depth of some of the faster fades cannot be accurately measured. On the LED, the noted scintillation depth was more in line with that observed using the 4 kHz tone (about 22dB peak) because the changes were slower and were more easily captured at the lower frequency. A final test was done using the Luxeon and Fresnel lens combination for transmitting and the same Fresnel as before for receiving. For this test, the LED current was reduced so that it was visually similar in brightness to that of the LED in the telescope. The Fresnel lens has a larger aperture than the 8 inch reflector telescope - about 117 sq. in. (759 sq. cm) - a bit more twice the area, so it was expected that lower scintillation would result. 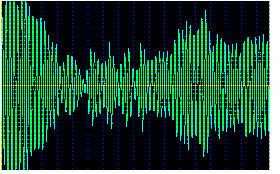 A typical sample of the scintillation on the 4 kHz tone may be seen in Figure 4. As in the previous clip, the 4 kHz tone present through much of the recording has been notched out - except during the specific 4 kHz test signal. Also present is the 120 Hz hum from urban lighting. As expected, the coherent light experienced more scintillation than the noncoherent light and that the rate-of-change of amplitude of the coherent light was much faster (and of greater depth) than the noncoherent light. In this test, both light sources were collimated approximately equally and from the same size of aperture. While much of the Laser's scintillation was due to the air turbulence, it is very likely that the severity of the scintillation was increased due to wavefront cancellation occurring due to the differing velocities in the cells of air through which the light passed. Comment: No attempts were made to "dodge" any nulls in atmospheric transmissivity that might have been occurring at the precise operating wavelength of the Laser. It has occurred to us that the light being emitted by the telescope is probably not phase-coherent across the entire aperture - and this would, no doubt, increase the likelihood of scintillation. It should be noted that achieving such phase coherence across such a large area would require extremely precise optics - something that the average experimenter would not likely be able to find or afford. Keep in mind, however, that even if a coherent wavefront leaves the transmitted optics, it only takes a short distance of travel through the atmosphere before the phase coherence is lost, anyway. What is significant is that, using just an ordinary high-brightness LED operated at a few 10's of milliamps, it was possible to get results that were significantly superior (in terms of amplitude stability) to those obtained when using the Laser. It also occurred to us that not every experimenter has a large reflector telescope that can be dragged around - and if they did, the bulk, weight, and fragility of this piece of equipment would greatly limit exactly where it might be taken. While the telescope has extremely good optics, it has also been shown that very good results can be obtained by using an inexpensive plastic Fresnel lens. While this lens is not as efficient a collimator as the telescope, one can overcome the Fresnel's inefficiencies by brute force, using an extremely high-output LED such as the Luxeon III - both techniques that quite practical to the experimenter. 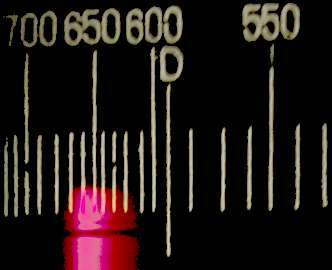 Typical scintillation of a 4 kHz tone transmitted from a 107sq in (690 sq cm) Fresnel lens using a high power LED. Again, it should be noted that this is an extreme example of the effects of scintillation. In the first half of this recording can be heard the 1 kHz tone being transmitted via the collimated LED: This tone is slightly distorted by the presence of mild scintillation, but it is largely intact. 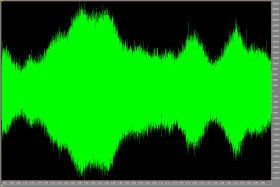 The 1 kHz tone in the second half of this recording, however, has significant spectral spreading caused by scintillation: The effect of scintillation is, for all practical purposes, a random noise source that is amplitude-modulating the tone. The scintillation rate is fast enough that it is well within the audible range, causing a very obvious "roughness" in the received tone. Is should be noted that in the case of the Laser pointer, its light needs to travel only fraction of the distance of the total path (1 or 2 kilometers) before its normal divergence causes the beam size to exceed that of the beam size emitted by the telescope, so much of the added distortion of the Laser pointer's signal is from its traveling through only that first portion of the optical path. While we were conducting the above experiment, it happened that the sprinklers in the adjacent cemetery turned on. While it was first feared that people and equipment were going to get wet, it soon became clear that they were safe - at least for the moment - and that the only effects were that the spray of water was going to cut across the optical path. Comment: It should be mentioned that while the voice being transmitted via Laser was slightly overmodulating the PWM circuit, much of the "roughness" in the voice heard throughout the recording is a result of distortion caused by spectral spreading of the audio frequencies by the scintillation. Because the sprinkler's path was very near the Laser, the droplet size in the sprinkler was a significant portion of the diameter of the beam from the Laser pointer - a property that explains why the disruption was so severe. With the collimated beam from the LED, however, there was no obvious disruption in the path: The only effect noted was acoustic feedback resulting from a reduction of transmit/receive isolation. Another experiment that was done on 8/14 involved looking at the Laser pointer and LED through an 8" reflector telescope. On this occasion, I attached a video camera to the telescope and then defocused the optics to spread out the beam from a point source to a much larger spot. Because this telescope uses a secondary mirror that partially blocks the optical path, there is a hole in the resulting image caused by that mirror. The first half of this video clip shows the light from the Laser pointer, while the second half shows the light from the collimated LED. As can be seen from the clip, the effects of the scintillation look quite different: The Laser's light is quite "speckly" with adjacent frames looking very different from each other. The LED's light looks a bit "smoother" by comparison - somewhat akin to looking at a streetlight through blowing fog (an affect that seems to be moving from right to left in the video) and there appears to be at least some similarity between adjacent frames. Interestingly, the video camera would not resolve the Laser light with good color saturation: During this test, the camera was adjusted and a fixed white balance setting was selected - and even when severely underexposed, the saturation did not improve. The color fidelity of the LED was much better with the same settings used for the Laser. It should be noted that the apparent spot size difference between the Laser and LED testing was a result of the telescope having been adjusted between the tests and not being returned precisely to the same settings, and the slight "jitter" in the image (most notable during the portion of the video with the LED) was solely a result of a stiff breeze coming up and causing the telescope to "bounce" slightly - something that is hard to avoid on an image with a resolution power capable of differentiating objects just two feet apart at a distance of 15 miles! Comment: A more technical discussion of this effect can be found in the paper "Free Space Laser Propagation: Atmospheric Propagation" by L.C. Andrews which is freely viewable on the IEEE website. During the 4/25 test, Ron connected a standard red LED - mounted in a small flashlight reflector - to his PWM Laser modulator just to see if it could be detected, or if I could see it with the telescope: Because I could see their individual LED flashlights, it was hoped that the LED would be powerful enough to be detectable: It wasn't. This was surprising, actually, as I expected that something would be detectable by ear. This test was thrown together at the very last minute and it probably failed owing to the fact that the reflector chosen (a cheap flashlight) was not well-suited for focusing the LED that Ron chose. If the LED and reflector had been better-matched, I have no doubt that something would have been detected. According to the initial analysis of the audio file using narrowband techniques, it is possible that a signal may have been detected - but it was more 90dB below the peak audio level received from the Luxeon and Fresnel lens. Another experiment conducted on 4/25 was one in which I removed the Luxeon emitter (with its secondary lens) from the Fresnel lens enclosure. Ron reported that with binoculars, the 3 watt Luxeon LED (with its secondary lens) was just visible and he could hear the "peaks" of the tone via speaker. Further analysis of the recording indicate that removal of the LED from the Fresnel reduced their received optical power by 55-60dB on average with scintillatory peaks at higher levels. Luxeon with secondary lens, but no Fresnel (MP3 audio file, 18 seconds, 217kB) The first few seconds of this file are with the LED installed in the Fresnel mount, but after 6 seconds, what tone is heard is from the Luexeon and secondary lens, only. Modulating tungsten (MP3 audio file, 1:46, 1252kB) In this stereo file, I am heard (via optical link at Gordon and Ron's location) on the left channel while the right channel carries the audio from my optical receiver. It is best to use headphones when listening to this file. Minor editing and filtering as been done on this file to reduce its length and to make it more listenable. Top: The method used to modulate the telescope. Bottom: Waveform of the Kennecott Strobe. Three strobe pulses (negative-going spikes) are evident. Shortly after this (and with hoarse throats from the screaming) we decided that it was getting late (it was past midnight) so we packed our gear up and headed home. From where Ron and Gordon set up, they could see the very tall (1215 ft, 370 meter) smokestack of the Kennecott smelter to the west of their location. Because of its height, it is well-marked with a set of strobe lights to provide warning to aircraft. Being curious, they pointed the optical receiver at the smokestack and from the sound of it, they could hear what sounded like multiple flashes. 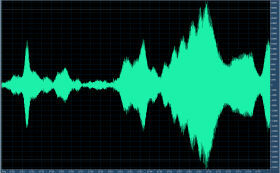 Later examination of the audio file bore this out, as seen in the middle picture of Figure 6. Kennecott Strobe (MP3 audio file, 0:35, 482kB) The "clicks" of the strobe are very apparent - as is the harmonic-rich 120 Hz hum from urban lighting. 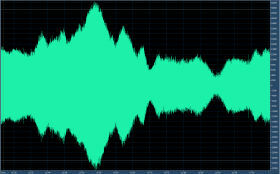 As can be seen from the waveform, there are at least three flashes. It is also apparent that the combination of optical receiver and digital recorder inverts the polarity of the received audio, so the initial impulses from the flashes are negative with a little bit of overshoot on the return. Also apparent in the image is the presence of 120Hz energy (from city lights) and harmonics. As mentioned before, we often heard the "clicks" of aircrafts' strobes as they flew by: Even though these were off-axis, their strobes were intense enough to be easily detectable. In addition to the strobing of aircraft, I could also hear a nearly constant "tick" in the background - but I never spotted the source of this noise. More may be added to this page soon - check back again. If you have any questions or comments on the equipment and/or methods used, feel free to drop me an email.